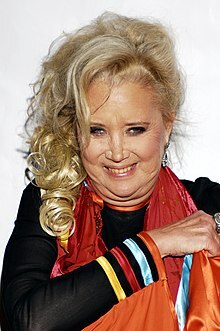 Sally Kirkland (born October 31, 1941) is an American movie and television actress. Kirkland was named after her mother. Her mother was a fashion editor for Vogue and LIFE magazines). She had small roles for 1970s movies (The Sting, The Way We Were and A Star is Born). She also starred in many television roles in the soap operas Valley of the Dolls and Days of Our Lives. Kirkland was born in New York City. This page was last changed on 9 December 2018, at 06:43.